The first college football playoff polls are out and, unsurprisingly, the Group of Five isn’t getting a whole lot of love right now. That’s why Fudge Van Hooser is here. Fudge comes back again this week to breakdown the top ten teams of the Group of Five so far this season. Two quick notes before I let him take it away: A) these rankings were as of the end of last Saturday’s games but updates are shown and B) aim any disagreements with the rankings at me not Fudge. Bowling Green has been on the outside looking in all year long. However, with the best offense through the air in the FBS averaging 430 yards per game, the Falcons have emerged into our NSLG Top 10. Their only two losses of the season are very respectable. Bowling Green lost to Tennessee in opening week 59-30, then almost stumbled over Memphis as they came up just short in a 44-41 loss to the fellow NSLG Top 10 team. They have only had two other close games since then, in a close win at both Buffalo and Purdue. 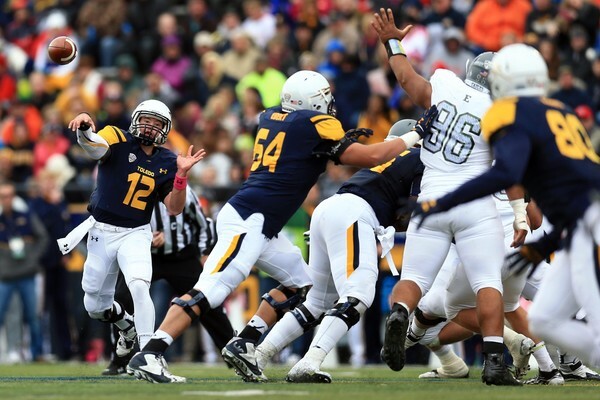 QB Matt Johnson is one of the nations best at the position with 3686 passing yards already through 9 games. WKU is an underrated team compared to some other teams on this list. 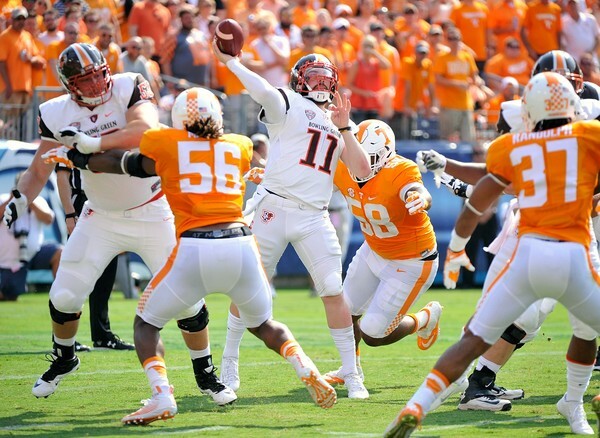 The Hilltoppers beat Vanderbilt on opening week, then two weeks later lost by only a field goal to Indiana. The second loss came from LSU, so…no surprise there. However, Western Kentucky did give LSU some trouble through that game, especially the first half, as they have proven that they can compete with some of the big brothers of the FBS. Western Kentucky may not have any shot to make it to New Year’s Day, but the Hilltoppers will certainly be a tough challenge for any team that will have to face them in a bowl game. Their offense even had 428 yards at LSU, so they can pick apart any defense. It’s just that this Hilltoppers team needs a defense too (giving up 27.3 points per game). WKU has blown past any team of their own caliber with the exception of a close game with Louisiana Tech. The last game on their schedule, Marshall, will likely determine which team represents C-USA East in the Conference USA championship game. This year’s Boise State is not quite the team that we saw in the last few years. Their two big wins came against Washington and Virginia (Boise won 56-14). The early loss to BYU certainly hurt the Broncos, but they still could have been in the picture if it wasn’t for the 52-26 loss at Utah State. 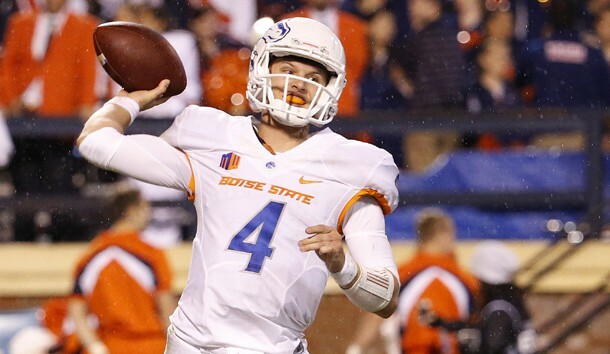 With a pretty balanced team that has a top 25 scoring offense and defense, Boise can still look to win the Mountain West and make it to a respectable bowl game, although they will need to be a bit more consistent. The Broncos have the blue field for two of their next three games, ending the season at San Jose State. If they win out, we may see Boise matching up with a Pac-12 team in a bowl game. Quarterback Keenan Reynolds tied the all-time FBS rushing record with his 77th touchdown on the ground. They certainly didn’t look quite as strong as they have at some points, given that their offense was even more one-dimensional than usual with only 16 passing yards. But the Midshipmen ran for 428 yards rushing. Keenan Reynolds, Chris Swain, and Dishan Romine stole the show with over 100 yards each, totaling 363 yards rushing with just the three of them. Navy hosts Memphis this week at 7pm/6pm Central on ESPN2 in what looks to be a fantastic game in the Quest for the West of the AAC. Marshall is once again a top NSLG team as they have been for years. But this time it’s the defense that has been the wind under The Herd’s wings. Marshall is only allowing 16 points per game so far this season. Even though they beat Purdue 41-31 in week one, the lone loss against Ohio and lack of any Power 5 teams remaining on the schedule will prevent Marshall from finding itself in a New Year’s Six game. 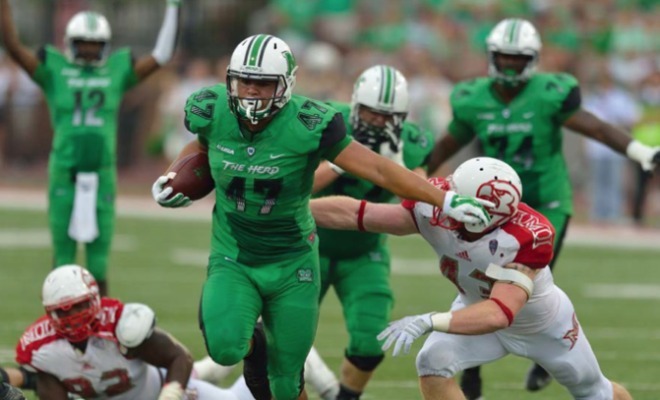 Still undefeated in C-USA, Marshall has a good chance to make it to the conference championship game if they can hold off a good Middle Tennessee football team and win the showdown against WKU at the season’s end. Temple looked strong last weekend when they hosted Notre Dame at a sold out Lincoln Financial Field. It was a hard-nosed game all night long in Philly. Quarterback P.J. Walker had an O.K. night going 13/30, 188 yards with 1 TD and 1 INT. On the ground, however P.J. Walker and Jahad Thomas combined for 104 rushing yards against a stellar Fighting Irish defense. On the other side of the ball, Temple forced 2 INTs and looked good at times, but it wasn’t enough as Notre Dame scored a late TD to win in a 24-20 thriller. Temple looked like they belonged in a game like this. Even with the loss, I still like Temple to finish strong as they will likely win the East and face either Navy, Houston, or Memphis in the American Championship. At the No. 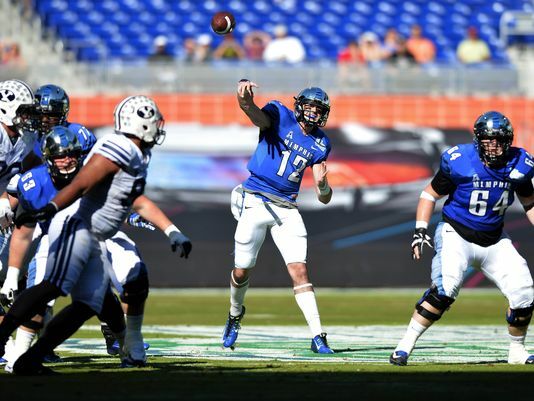 4 spot we have another team that we disagreed with the CFP Committee on – Memphis. The Tigers come in at #13 in the first release of the CFP Rankings. In the first half of the Tulane-Memphis game last weekend, they showed some weaknesses against the Green Wave. Tiger receivers tallied up nine dropped passes in the first half resulting in a fiery Paxton Lynch coming out in the second half. But it wasn’t just poor offensive plays, on defense, Memphis revealed where they’re vulnerable. To open the game, Tulane had an 11-minute drive where they nickeled and dimed their way to an eventual TD on the ground from RB Dontrell Hilliard. Quarterback Jordy Joseph, a former walk-on, picked apart Memphis’ defense in the first half. Whenever the Wave could succeed in the short throws, that is where the run game opened up. Then in the second half, Memphis made their adjustments, and Tulane (oddly enough) seemed to have changed up their game plan. After their biggest deficit of the season (trailing 13-0), Memphis scored 41 unanswered points in a 41-13 win over Tulane. App State is one of the few, the proud, the only half decent teams in the “FunBelt”. Their one loss came to Clemson in an ugly game early in the year. That loss looks a bit better now as Clemson is number one in the first CFB committee poll. Appalachian has the 5th best scoring defense only allowing about 14 points per game. With their four remaining conference games, it should be easy for the Mountaineers to roll through the rest of their schedule. Marcus Cox leads the offense with just under 1,000 rushing yards for the first 9 weeks. Half of the Midwest has been on the Toledo Bandwagon ever since they knocked off Arkansas at the beginning of the year. After beating Arkansas and Iowa State back-to-back, no team as of Week 9 had come close to beating the Rockets. Toledo has one of the best rushing offenses in the FBS along with a defense that only allows just over 18 points per game. Expect their MACtion schedule to get tougher as these next few weeks go by with games against Northern Illinois, CMU, Bowling Green and WMU. Houston continues to look unstoppable, despite what the first release of the CFP Rankings tells us (Houston is ranked #25). Houston cruised past Vandy 34-0 in their second win over a Power Five team. Sure, Vanderbilt is not very good this year, but even Ole Miss struggled with the Commodores a little bit. Houston’s offense looks like it cannot be stopped. Greg Ward Jr. is leading the 5th ranked offense in the country with 27 total TDs as he leads the FBS with 16 TDs on the ground. The Cougars take on the Cincinnati Bearcats on Saturday at 2:30, which will be the toughest test they’ve had in about a month. The following week will be the real test as the Quest for the West continues with Houston-Memphis on November 14th.